From Phitsanulok town, take Highway 12 to Lom Sak. It takes around 44 km until you reach Kaeng Song where the rafting centres are located. Guide, raft, restaurant, toilet, accommodation and parking. Namtok Sidit and Namtok Kaeng Sopha. The water turns into a brown colour in the rainy season and crystal-clear green colour in the dry season. 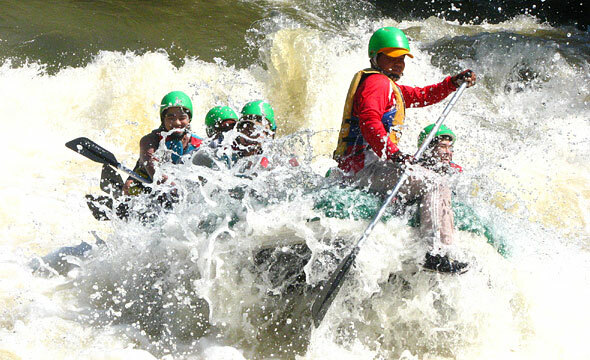 White-water rafting here takes around 3 hours for a distance of 8 km. through the entire 18 exciting rapids with difficulty Levels1-5. 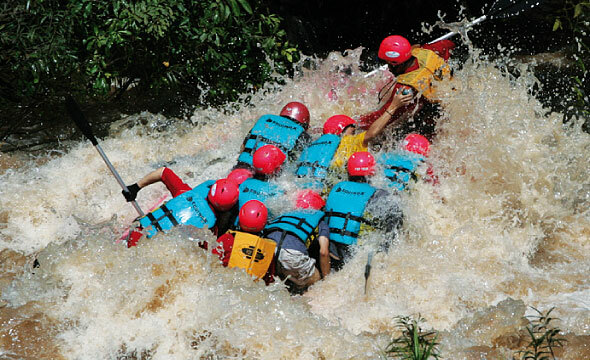 Besides fun, excitement, and challenge, you will see astonishing scenery and lush green trees along the Khek River – one of the best white-water rafting routes in Thailand. Additionally, there are rescue teams on standby at all risky rapids. The boat journey starts at “Kaeng Tha Kham”, small rapids allowing paddlers to practice manoeuvering and navigating the inflatable boat for a while before continuing to the next rapids. 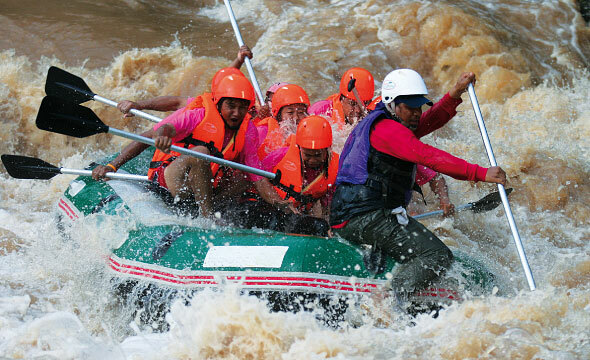 “Kaeng Sai” – the zigzagged level-3 rapids covered with thick bushes and trees, navigating the boat through this rapid requires experienced rafting skill, as the streams will be divided into two. Next is “Kaeng Pak Yang” – a 100-m-long rapid with difficulty Levels 2-3. Afterwards, the ultimate fun begins when reaching “Kaeng Hin Lat” because of its strong torrents. Paddlers have to hold on tight to the boat; otherwise, they will end up in the water or bounce backwards to the stern. Along to another exciting rapid “Kaeng Suan Ratchamangkhala” paddlers have to manoeuver the boat through ledges in the middle of the waterway. Here, waves can be as high as 1 m if rafting when the water level is rising. 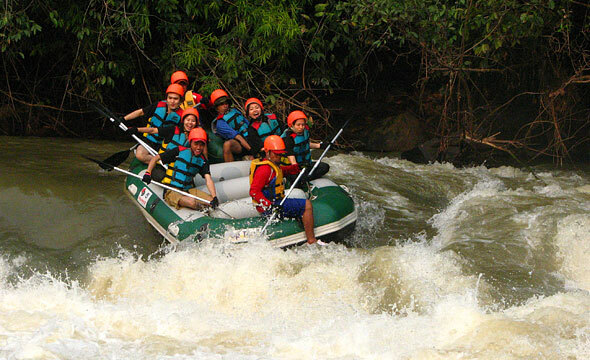 The flow will bring you to “Kaeng Sang”, a wide rapid with rocky ground in different steps. The difficulty here is classified at Levels 4-5. We then continue to an S-shaped rapid “Kaeng Sopha Ram” and “Kaeng Nang Khoi”, the nature of these rapids are like steps with strong and high water waves. 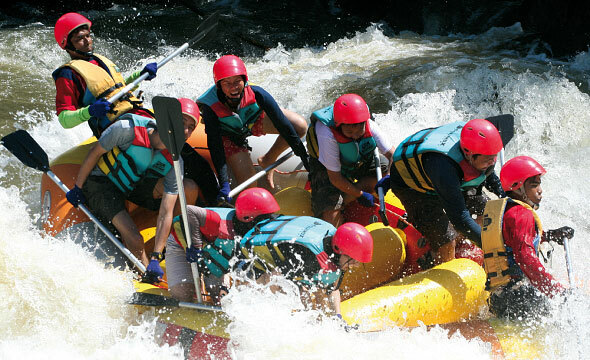 Therefore, advanced rafting skills and teamwork are needed to conquer the boulders and ledges under the water. Be proud of yourself if you can pass this area without the boat being flipped over. Continuing to a 100-m-long rapid “Kaeng Yao”, the current flows through boulders and ledges, which are submerged under the water in the rainy season. In some parts of the rapid, the water level can be shockingly decreased. Advanced paddling skill is compulsory. 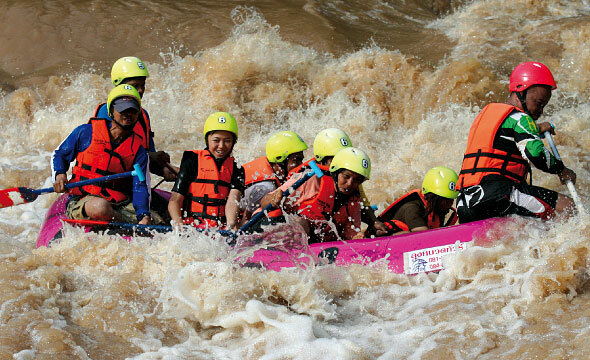 Once conquering “Kaeng Yao”, the remaining rapids – “Kaeng Dong Sak”, “Kaeng Wang Nam Yen” and many more – will be easy for you since they are scaled at Levels 2-3 only. Before reaching “Kaeng Thap Khun Tai” – our final rafting destination, you can let yourself float in the river. "Do not miss Kaeng Song Coffee, the famous Phitsanulok’s local Arabica coffee with intense taste and sweet aroma. Additionally, there are many restaurants along the Khek River where you can taste fresh river fish dishes."